There’s something about a Latin America movie about demons that seems a bit more real. Perhaps it’s the fierce overshadowing influence of the Roman Catholic Church? There’s also the ever lurking spiritual horrors of what lurks in the wilds. What monsters were there before the Spanish conquistadors claimed the land for the Pope backed Spaniards? 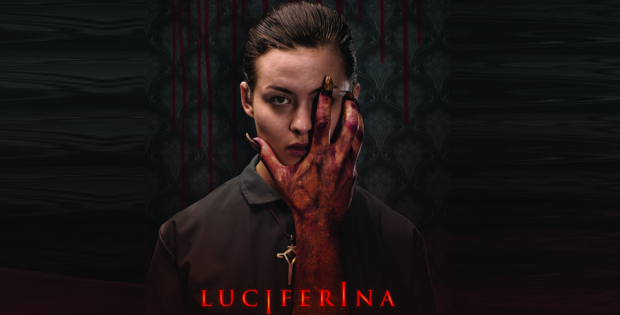 Luciferina promises a demonically charged cinematic tale that involves a hallucinogenic drug from Argentina. Are these people tripping or falling down a hole to Hell? Natalia (Sofía Del Tuffo) is a virgin living in a convent preparing for her life as a nun while serving the other sisters. She enjoys the sheltered life. However this doesn’t last long when the Mother Superior has to send her home to take care of her critically ill father. The guy is wrapped up like a mummy. Natalia isn’t happy because she didn’t like her homelife. She keeps having freaky dreams as she returns. She’s also freaked out by her sister’s creepy boyfriend who is fixated on taking her virginity. She reluctantly agrees to go with her sister and others into the jungle to track down a plant that will give them visions. The gang wants to have a ritual inside an abandoned Catholic property with the help of a local Shaman. They going to get high, light a bunch of candles and trip out. Except this time the trip truly unlocks something inside Natalia. Luciferina is a hypnotic charmer that isn’t out to merely get you to jump out of your seats with a few well placed shocker moments. Things build in both the seductive spiritual angle and the grotesque demonic level. There’s an amazing transition when Natalia sees that this simple nature ceremony is in fact a Black Mass complete with human sacrifice inside a pentagram. If you enjoy your horror with a devilish intent, Luciferina is a captivating fever dream from the jungles of Argentina that won’t let go of your eyes. The video is 2.35:1 anamorphic. Things look sharp whether in the city or the jungle. The special effects look fine under the resolution. The audio is 5.1 Surround and 2.0 Stereo. Both tracks are in Spanish. the 5.1 mix is good for when the drugs kick in during the ceremony. The movie is subtitled in English. Trailer (1:59) sets up the fear. Artsploitation presents Luciferina. Directed by Gonzalo Calzada. Screenplay by: Gonzalo Calzada. Starring: Malena Sánchez, Sofia del Tuffo, Marta Lubos, Pedro Merlo and Vando Villamil. Rated: Not Rated. Running Time: 114 minutes. Released: November 20, 2018.